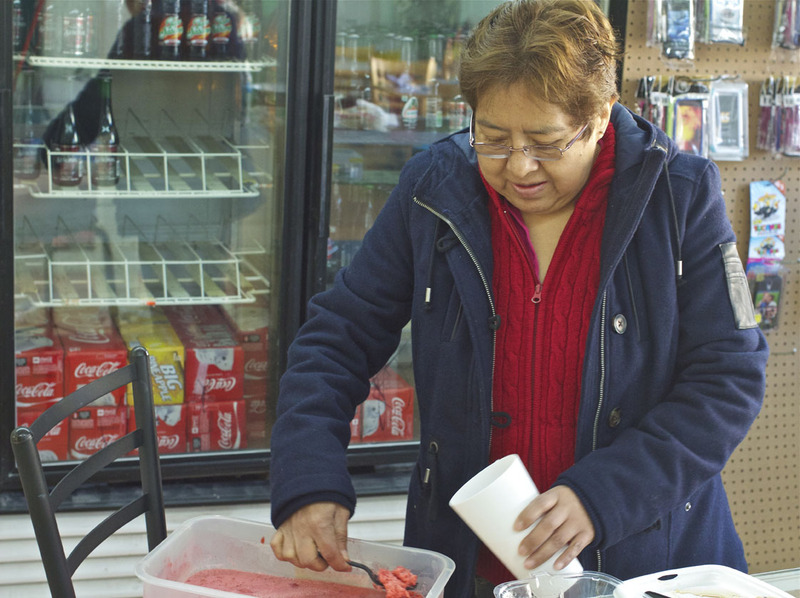 At 1:30 p.m. on a Monday, Gloria Gonzalez, 43, stands behind the counter in Don Jose Tienda Mexicana’s new location at 104 S. Merritt Mill Road in Carrboro. The tables reserved for dining patrons are empty, and there are no other customers in the store. She and another employee watch “Shark Tank” on a television behind the counter. Gonzalez, the previous owner of Don Jose Tienda Mexicana, said after 10 years at the 2,000-square-foot space at 708 W. Rosemary St. in Carrboro, the store was forced to move in early February after the rent doubled. “It is affecting business, but we’re going to pull through,” Gonzalez said. The new location is smaller, and tucked inside an alleyway across from Al’s Garage, about a quarter of a mile from the old location. When Natalia Lenis, the office coordinator for Carrboro’s El Centro Hispano, saw the empty space on West Rosemary Street, she said she originally thought Don Jose had closed entirely. As a business partner with El Centro Hispano, Don Jose is able to advertise at El Centro Hispano events throughout the Triangle as well as through the organization’s newsletters, Lenis said. Employees also have access to classes and programs. Lenis said that El Centro Hispano uses Don Jose, as well as other businesses, to promote outreach programs for the Hispanic community. Bill Dimos, the landlord of Don Jose’s previous space, declined to comment about the increasing rent as well as on any new prospects for the space. Another tenant in the same building, who wished to not be named, said his rent had not increased. The terms of his lease were not disclosed. Gonzalez sold Don Jose to her brother, Pablo Gonzalez, after the move in early February. Despite having less space, Don Jose still offers everything from the previous location, including a barbershop, cell phone accessories, and a money transferring service. Gonzalez said she believes this will continue to bring in customers. Gonzalez said the barbershop is responsible for a lot of incoming customers, and since it moved with the store she thinks this will continue. Don Jose also offers a full-service restaurant featuring Hispanic food such as tamales, tacos and enchiladas, as well as Hispanic goods not found in other Carrboro grocery stores, like Jarritos Mexican soda and various hot sauces. “Carnitas tacos are the most popular menu item, by far,” Gonzalez said. These tacos are made with slow-cooked pork, which is then sautéed or fried and comes on a corn tortilla with cilantro and onions or pico de gallo. Chyenna Jessee, owner of Jessee’s Coffee and Bar across from the previous Don Jose location, said she didn’t know about the move until she saw a sign advertising that the space was now for lease. Lenis believes the move will have an effect on the Hispanic community in Carrboro. Alex is Co-Editor of the Carrboro Commons and a journalism student at UNC-Chapel Hill.